My favorite sandwich shop is called “Which Wich?” located on Sawtelle Blvd. just south of Olympic in West Los Angeles. I like this place because it reminds me of a sandwich laboratory where you hone in on the perfect sandwich based on empirical evidence over time. You fill out a sandwich formula form where you specify your meal’s ingredients down to the last pepperoncini. Then you pass along your formula to the cashier who sends it on to the lab technicians who rapidly and meticulously build your mouth-watering sandwich. It’s a great experience to get something to eat exactly the way you want it – a scientist’s dream. The other day I was waiting in a very long line for my lab sandwich when I noticed this guy in front me taking a picture of something on the wall with his cell phone. 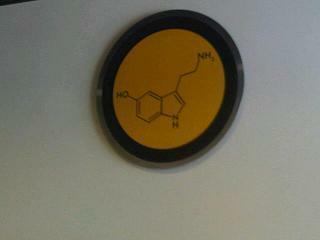 The wall has a bunch of round, 2 foot diameter decorations, a smiley face, a peace sign, a surfer riding a wave, and the chemical structure of an amino acid! This is what the guy was photographing. I did a double-take and thought to myself, WTF. Why in the world would that be hanging in a sandwich shop? It appears the amino acid (see inset) is close to Tryptophan, but has a molecular formula of C12H18N2O. But the question remains, why there? Next time I’m over there, I’ll have to ask an employee what it all means, but I’m just happy to see a little bit of science in such a strange place. Is it Tryptophan or not? Maybe it is found in turkey sandwiches?